World Tourism Day has been celebrated since 1980 on 27 September, the day in which the Statutes of the World Tourism Organization (UNWTO) entered into force. Official celebrations of World Tourism Day 2017 will be held in Qatar. The UN General Assembly declared the year ahead as the International Year of Sustainable Tourism for Development with the emphasis on ‘Tourism as a driver of economic growth’. Sustainable tourism is all about economic growth with cultural preservation and social inclusiveness – accessibility being an indispensable element. It is defined as: “Tourism that respects both local people and the traveller – their needs and expectations, cultural heritage and the environment.” It seeks to benefit the people of the host country. It should take full account of its current and future economic, social and environmental positive impacts. Taleb Rifai, Secretary-General, World Tourism Organization (UNWTO), in his official message stated: “Last year alone, 1.2 billion travellers crossed international borders in one single year. Ageing is inevitable for everyone and sets new needs that shape travel decisions. People over 65 years are those who have the time, desire and purchasing power to travel. It is estimated that they make up at least 16% of the world travelling population. Globally, it is estimated that there near one billion persons with restricted mobility, as well as another two billion people, such as spouses, children and caregivers of such persons, those temporarily immobile, representing almost a third of the world’s population, who are directly affected by dis-ability. This signifies a huge potential market for travel and tourism. But, it still remains vastly underserved due to inaccessible travel and tourism facilities and services, and discriminatory policies and practices. The world of travel and tourism is a people-oriented fast growing industry. The access and safety needs of world touring population are diverse. But every human has the right to enjoy leisure and tourism without obstacles. Failure to provide safe and equal access to a facility or equal treatment in a service – such as in tourism – constitutes discrimination. Planning for as broad a range of travellers as possible implies planning for people with varying physical and sensory abilities. It will enable them to take an active part in travel and tourism with minimal risk of injury. Enabling that to happen is an indispensable lucrative business opportunity providing rich dividends for companies and destinations. Also, businesses have a moral duty, social responsibility and a legal obligation to make their facilities accessible equally to everyone. Accessibility in tourism promoting universal accessibility was the international theme for the year ended. It is about the commitment, endeavour and creation of tourist destinations to ensure that built environments and facilities, products and services are accessible and cater for the needs of the widest possible range of travellers with safety, regardless of their physical limitations or age. (i) Hotels and guest houses that can cater for the essential facilities and safety needs of everyone, focusing the principles of universal design. (ii) Clearer, precise, more accessible and reliable information on accessibility and safety of tourism facilities, products and services for these sectors. (iii) Adequate overall training for tourism professionals at all levels. (iv) Accessibility standards and guidelines throughout the tourism sector. (v) Independent assessments by truly competent accessibility experts to evaluate these provisions against internationally accepted design standards. Where exactly are we today? 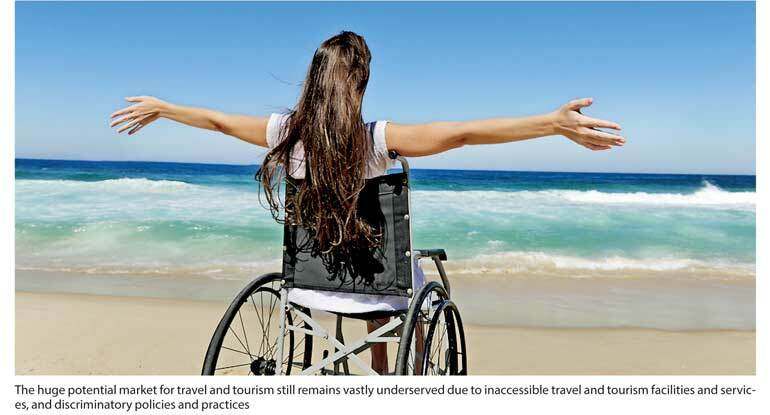 Sri Lanka Tourism is yet to get off the ground with accessible tourism. The travelling population with physical and sensory impairments remains an overlooked growth market. Their high-spending potential remains untapped due to lack of right facilities, failure of staff to acquire the skills necessary to attract and serve them knowledgably, and absence of marketing skills to earn their business. Bits and pieces of facilities here and there cannot systemically target them to serve the purpose well enough nor bring the advantages accessible tourism can bring us. None of these five goals identified last year is yet recognised by Sri Lanka Tourism. No wonder, importantly, increasing numbers of travellers complain that the facilities and accessibility needs they booked are not the ones they truly find on arrival here. Assessments and evaluation by independent accessibility experts for compliance with minimum standards and access regulations are completely overlooked in awarding certificates of conformity and assigning four or five or six star grades. Toilets and wash facilities at most five and even newly-given six star hotels remain safety hazards even for the ambulant. Often they are inaccessible for independent travellers using wheelchairs. Basic safety features are either missing or wrongly positioned. Most restaurants and ballrooms do not even have a single accessible table or a nearby accessible toilet, causing much embarrassments to seniors attending weddings. Emergency alarms are unheard of even by most city hotels. There are several reputed hotels awarded five-stars without even a single room with proper essential access facilities! Although the ruling given by the apex court of the country in April 2011, and the accessibility regulations that are in force approved unanimously by the Parliament of Sri Lanka on 20 March 2007, state the minimum number of rooms that must comply with design standards, they are never taken into any serious consideration in granting STAR statuses in the classification of hotels. Even after 10 years, these court rulings and laws are yet not incorporated into UDA building regulations. We also have ratified in 2016 a UN Convention of 2006 to assure the world that immediate steps will be taken to ensure that the people with limited ability in Sri Lanka shall start enjoying their inherent rights. This is just another convention Sri Lanka is failing to honour as promised. We cannot fool all the people always! Accessibility experts perform a highly responsible specialised job, involving money, time and effort concerning precious human life. It requires a good in-depth understanding of intricacies, adequate practical experience and thorough working knowledge that goes beyond text-book knowledge. It is not one where standards and specifications can just be read and applied in vital tasks. Politicians and decision makers here still believe that the architects and engineers in the building construction industry are alone competent enough to ‘break barriers and establish a just society inclusive to all’. Looking at reality proves that, absence of the services of experienced accessibility experts is a very costly blunder that fuels social exclusion and loss of business opportunities and good name. This adverse trend is reversible. The Justice Ministry on high priority must take immediate steps to ensure laws and court orders of which failure to implement thereby are affecting the lives of the largest minority of Sri Lanka estimated at 20% of our population are enforced enabling to enjoy their inherent right to access public facilities with dignity and without marginalisation, regardless of their degree of ability. The goal the Ministry of Justice should achieve here is: all facilities at up-coming cities, towns, basic urban infrastructures and; services under new Megapolis agenda, hotel industry in particular that the public will use in daily life, shall comply with court orders and accessibility regulations. As UNWTO Secretary-General Taleb Rifai concludes, you should be the change you want to see and may you be an ambassador and activist to bring these changes for Sri Lanka to become the tourism destination of choice soon.